There are many different water sources for municipal water – including watersheds, lakes, streams and rivers. However, the treatment process remains similar across the board in the Denver Area. Use this five-step process below to learn the journey of your water from source to sink. 1) Screening – Surface water typically contains large debris (think fish, leaves, trash, etc.). If these objects make it to the water treatment facility they can clog the system, so they must be removed beforehand. Systems that utilize surface water have screens covering the water intakes, catching any debris too large to fit through the holes. 2) Coagulation and Flocculation – this means that chemicals with a positive charge are added to the water. These chemicals help neutralize the negative charges in dirt and other dissolved particles that remain. This forms floc, which is large particles formed by the chemicals combining with the dissolved particles. 3) Sedimentation – after flocculation, your local water treatment authority lets the water sit for a while. During this process, the denser floc particles sink to the bottom of the tanks, forming sediment. 4) Filtration – After the floc settles, the water is taken from the top of the tank. It then passes through a series of filters (usually made of sand, gravel, and charcoal). The different compositions and pore sizes of these filters help remove dissolved particles, such as parasites, bacteria, viruses and chemicals. 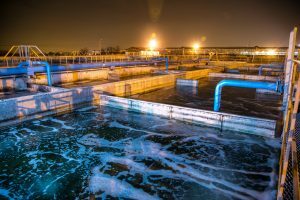 5) Disinfection – After filtration, a chemical such as chlorine or chloramine is then added to the water. This is done to kill any remaining parasites, bacteria, or viruses. This also protects the water from germs on the way from the treatment plant to the homes. While water may be treated differently in different communities, this is a common way that water is treated. Groundwater, for example, may have a much lighter screening and filtration system because of the lack of sediment, pollutants and contaminants. Regardless of location and your municipality treatment methods, you can always be sure that you’re getting clean water by using Culligan’s Whole House Water Filter or Reverse Osmosis systems. Whether you’re getting treated surface water, groundwater; or well water, you will be able to give your people crisp, clean, clear Culligan Water.